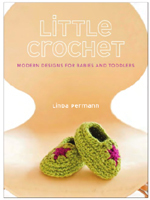 Little Crochet: Modern Designs for Babies and Toddlers is now available! Try IndieBound, Amazon, Borders, Barnes and Noble, or Potter Craft! Watch the video trailer, read reviews, and follow the Blog Book Tour! 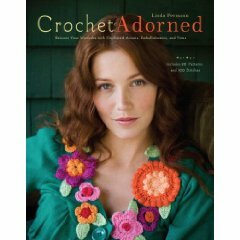 Crochet Adorned: Reinvent Your Wardrobe With Crocheted Accents, Embellishments and Trims is available at local yarn shops and fine book stores everywhere- ask for it! Or, order online via Barnes and Noble, Borders, Potter Craft, Amazon, IndieBound or Powell's Books (signed copies!). For wholesale ordering information from Potter Craft, please call: 1-800-729-2960. To schedule crochet classes, a trunk show or book signing, please e-mail me. Welcome to LindaMade. This website is ? Linda Permann, 2007- 2014.